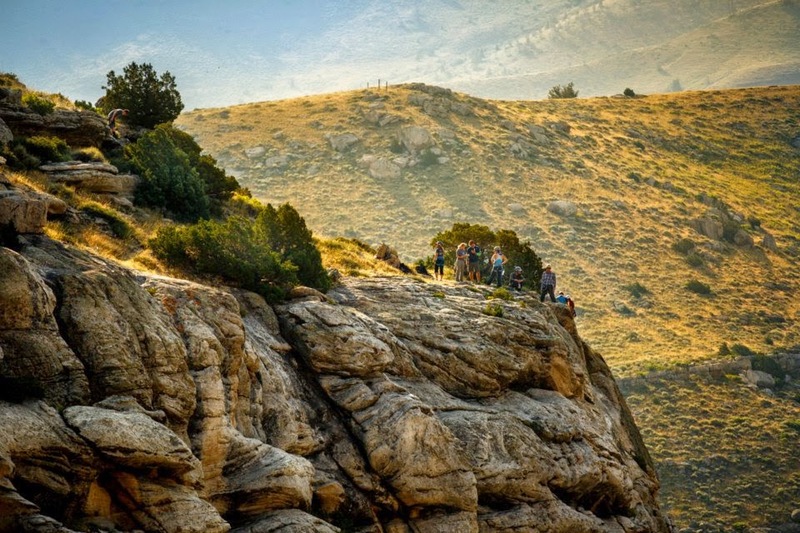 NOTE: This is the third in a series of posts about Cowboy Tough multi-day adventure race. I (Emily) worked together with my teammate Mike to write most of the text, and then Mike added in his own comedic flair in red italics. Enjoy! View of the rappel wall from our sleeping spot. Instead of being woken up by alarms, we’re rustled awake by the huge gusts of wind rushing through Sinks Canyon State Park. They’re strong enough to make Emily wonder if the rappel will still go as scheduled. But as our alarms start chirping at 0515, the winds start to die down somewhat as sunshine creeps into the campground. We've gotten about 2.5 hours of “rest”, and if we’re lucky most of that has been actual sleep. We hustle through prep for Day 2: getting food in our bellies, caffeine in our system, packs packed, teeth brushed (The value of good dental hygiene cannot be understated. ), bathrooms destroyed (Andrei’s nugget of wisdom on this morning was to start every day of an expedition race with a good poop, something he picked up from the GearJunkie himself, Papa Regenold. Good advice I must say. ), and the mandatory quarter safely zipped in the correct shorts pocket. Mark, the race director, calls all prepared teams to the center of the campground for Day 2’s official start. Since everyone made it into camp at various times last night, we all sleepily look around to see who’s answered the call for Day 2. Not surprisingly, Tecnu and Columbia look fresh and ready to go. The Yogis are there too, along with our friends Journey Racing and Silent Chasers. Mark reads off his list of starters and Emily doesn't hear WABAR’s number called, so after he’s done she shouts out “AND THREE-OH-SEVEN TOO!”. It’s a very, very proud moment for her and the team - after going through all of the challenges of yesterday, we have recovered* and are ready to throw down again with the top teams of Cowboy Tough. Bring it on! In this case “recovered” is a relative term and likely meant different things for each of us. For me it merely meant that my legs were no longer cramping. They were however more than a little sore from all that extra work they did while seizing up on me the day before. All things considered though, I was feeling ready to go. Start of Day 2. We slept at EOD01/SOD02. 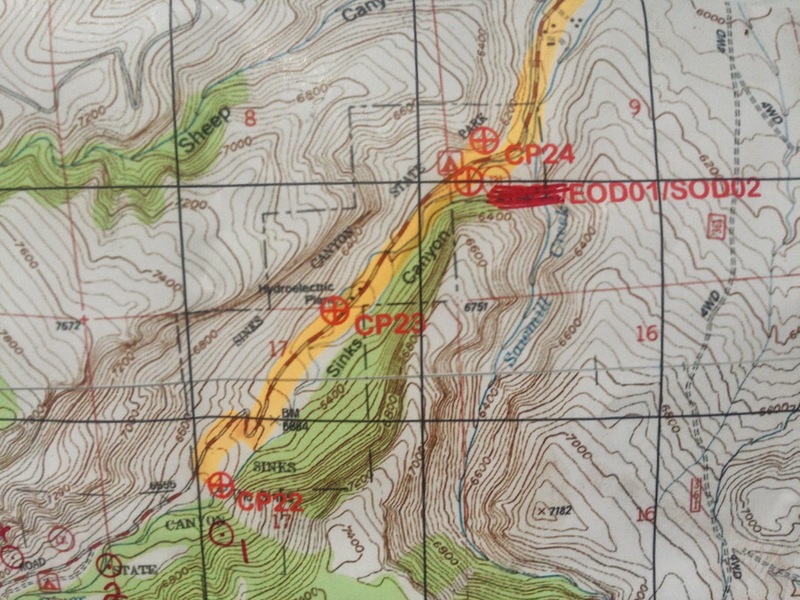 Then we ran to CP22 (The Sinks), then to an unmapped cave, then to CP23 (The Rise), then to ropes at CP24. We all take off packless to CP22 at “The Sinks”, a unique feature of the state park where the Popo Agie River disappears underground. Then we run to “The Cave” which just looks like a boulder field. But race staff direct Andrei to the tiny hole in the ground and he gets the privilege of spelunking the 500-600’ for the underground punch. The rest of us WABARians get to chat with the other teams who are waiting as well. We’re super proud to let everyone know that yes, we did indeed clear the course yesterday! Once Andrei emerges from the cave (“what was it like, Andrei?” “it was a hole in the ground with a man at the end of it” Andrei is nothing if not concise and to the point with his assessments) we run to “The Rise” where the Popo Agie river comes back above ground and we use the mandatory gear quarter to feed some really large fish. 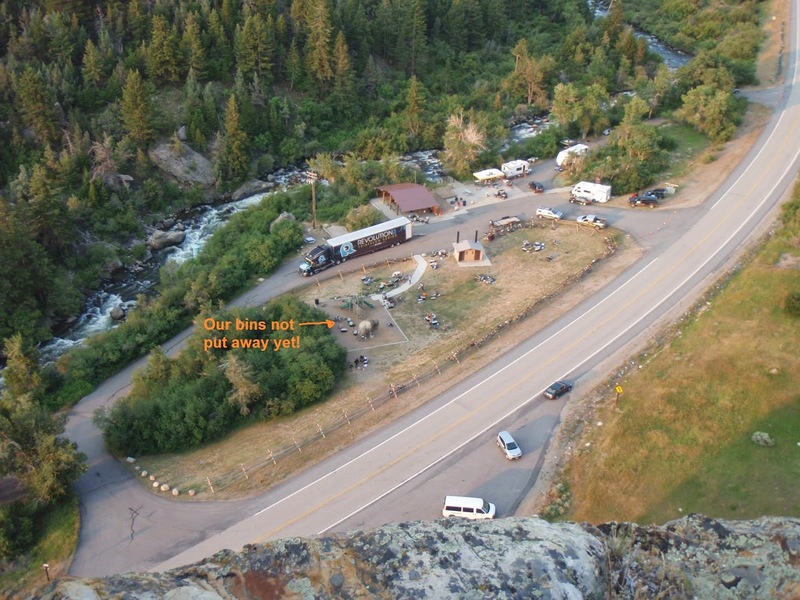 Then we check into the start of the rappel which is directly across the road from our campground. Top of the rappel. Photo by Chris Radcliffe. At this point in the morning, we’re in 4th behind Tecnu, Columbia, and YogaSlackers. Since there are only three rappel lines set up, we take our time climbing the 200’ or so up to the top. Once we’re there, we only have to wait a few minutes for Tecnu to clear their line before we can start. Emily volunteers to go first and makes it to the bottom with no issues. Then Rachel, then Andrei, and pretty soon Mike’s flying down the rope and we’re all running back into TA. View of TA from the top of the rappel, taken by Tecnu. You can see our bins still laying out! We rode from CP24 to CP25. With Emily’s crank re-attached to her bike, we fly out of Sinks Canyon on a very smooth paved descent. We’ve got a quick punch at CP25, and then it’s into Lander for CP26 at Wild Iris Sports. Yesterday, if we couldn’t get Emily’s crank fixed, we had planned to stop here for professional assistance, but that is no longer necessary which is great because the shop’s not even open yet! 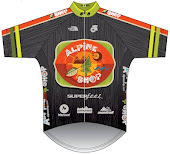 It’s probably a good thing the shop’s closed, since Mike would have probably gone shopping for a new, lighter bike, costing valuable race time. (Yup, I was totally ready to trade my 31lb beast in for whatever they had under 23lb.) We also get to say hi to one of our favorite volunteers, Emma from Orange Lederhosen! Emily took a quick break from the paceline to take pictures. The only navigation challenge to this leg is very specific left-hand turn onto Rendezvous Road. 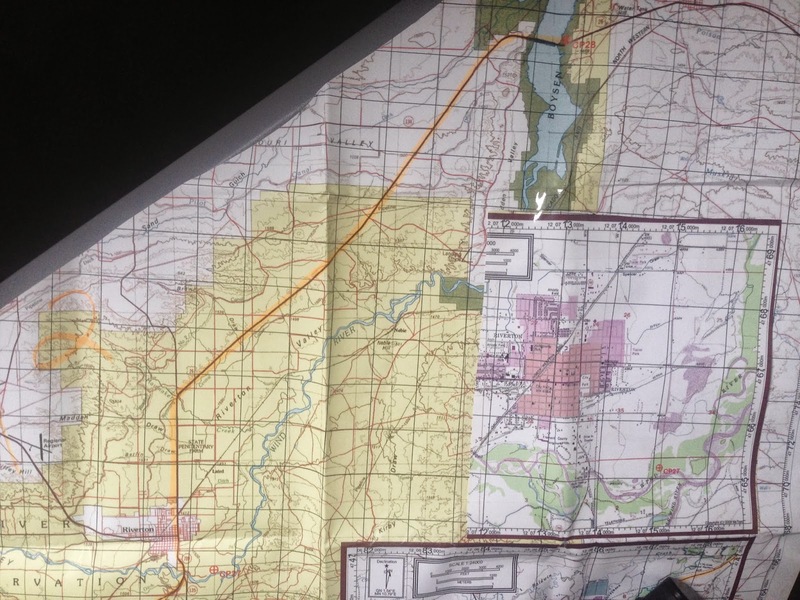 Mike’s watching the maps carefully, but the intersections don’t appear to be signed as we fly down the highway. Suddenly, Mike yells “there it is!”*, except Rachel and Andrei don’t hear him over the traffic noise and continue riding past the turn. This is not good. Emily and Mike start yelling for Rachel and Andrei to turn around, but it’s no use. Emily sprints after her teammates and finally gets their attention. *Full disclosure, I totally thought I missed the turn and was improvising. I knew the road would take us to Riverton, which would take us where we needed to go. It wasn't until AFTER the turn that Andrei mentioned that he saw a sign for Rendezvous Rd. Had I played it a little cooler I probably could have done a more convincing job of selling the fact that I made no mistake. We all regroup into our paceline after making the turn, but Emily can’t hang on, even with the draft. She yells again for a tow and Mike (or was it Andrei?) helps her out. “Are you okay?” Mike asks. “I’ll be fine in a bit, I just blew up a little,” Emily replies. She sits in the draft for the remaining miles into Riverton, where we have to piece together some sketchy map info with race instructions to “look for the Maverick’s gas station and turn right”. We tentatively ride through the town looking for the 1853 Historical Site. Just when we’re convinced we’re in the wrong spot, Andrei spots a faded sign and we ride into the CP. We are greeted by Zach from Rev3 who points us to a shady grove where the special challenge is set up. We’re met by a dude named “Numbers” dressed in what we assume to be historically accurate buckskin. He gives us a quick lesson on how to throw a tomahawk and says that we all have to stick a throw before we’re awarded the punch. And as a bonus, the CP staff have fun historical accessories for us to wear while throwing the ‘hawks. Let’s play dress-up! Numbers showing us how it's done. Photo by Chris Radcliffe. Mike cowboys up and sticks his throw on the FIRST TRY. There is a reason we call him “The Garrison”. Rachel and Emily are next after a few tosses, and Andrei gets his to stick as well. Sweet! The Rev3 staff also tell us that we’re in 4th overall so far behind Tecnu, Columbia, and YogaSlackers. Even sweeter! We hop back onto our bikes for more flat paved road riding. Ride from Riverton to Boysen Reservoir SP. The second bike leg is very much like the first one - flat and paved! We feel that as Midwesterners we are especially well-trained to handle these conditions so push a little harder than “luxury racing” pace. Zach told us it was a 14mi ride, but our pre-race map analysis said 20mi, and when we reach the 14mi marker there is no lake in sight. But guess what...Emily’s crank is loose AGAIN! How did this happen? We stop precariously on the side of the highway to perform another too-small-and-soft plastic tire lever fix. Same as yesterday, it works, but only for a mile this time. The team decides to put Emily in the back of the paceline, and on tow, and just have her coast into TA. And, because of the favorable road conditions, she doesn’t hardly have to pedal to maintain 15+ mph. That’s what teamwork and drafting will do! We finally spot the Boysen Reservoir and, on the eastern bank, the Rev3 Mobile TA. We cruise right up to it and start transitioning to paddle mode. Out of pure luck, JR the medic is working at this TA so Emily asks him to borrow his 10mm hex wrench again. This time, he says, “Just keep it!” which is infinitely helpful since we have a huge bike ride tomorrow. We all change out of our bike shorts and into bottoms more comfortable for paddling and trekking. Then Emily invokes the spirit of her Alpine Shop teammates Jeff and David as she picks out 2 canoes for the team with working seat backs and minimal bottom warping. Then we assemble paddles and put in! Day 2’s course continues to be tailored to “Things That Midwestern Adventure Racers Are Good At” since we have a 6mi lake paddle in canoes. And it’s HOT. We set up with Emily and Mike in one boat, Andrei and Rachel in another, and Emily navving. We’ve been warned about strong afternoon winds but for now the air above Boysen SP Reservoir is hot and still. The first 6 miles are rather uneventful and soon enough we are nearing our take-out spot for a 3-point optional trek. Andrei and Rachel's boat on the first paddle leg. We take out on a sandy beach with exactly zero shade options. We all make sure we’ve got enough water, even for this shorty trek, since the terrain doesn’t have any shade, either. As we jog off, we discover the ground to be unlike anything we’ve ever trekked on - dried sand with embedded round rocks, and the occasional cactus. It seems like we’re running across a lake bed with no water, except it’s not flat. All of the clues to these optional CPs are “high point” so we soon find ourselves trekking uphill on assorted game trails for each of our punches. Once we’ve got everything, we find a two-track to take us back to the boats. We’re all roasting in the exposed heat so we take our sweet time getting back in the boats - Andrei breaks out his Magic Sack and everyone gets new water in their bladders, and we all go for a swim as well. More paddling! 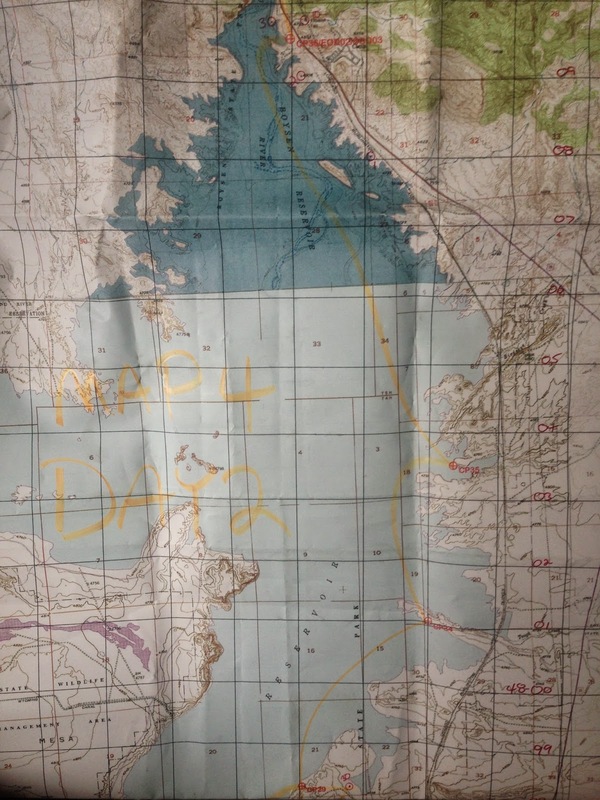 The map color mis-match was obvious and Rachel called it "the deep end"
On one hand, we are thankful the winds have not picked up yet because it makes the paddling easy. But on the other hand, we are absolutely broiling in the still, hot air. We dodge tube-pulling-speedboats on the way to CP34 which is located very close to a popular beach/camping spot. Emily is tentative on the attack but as we get closer to the shore, Andrei and Rachel spot the flag and paddle in for the punch. 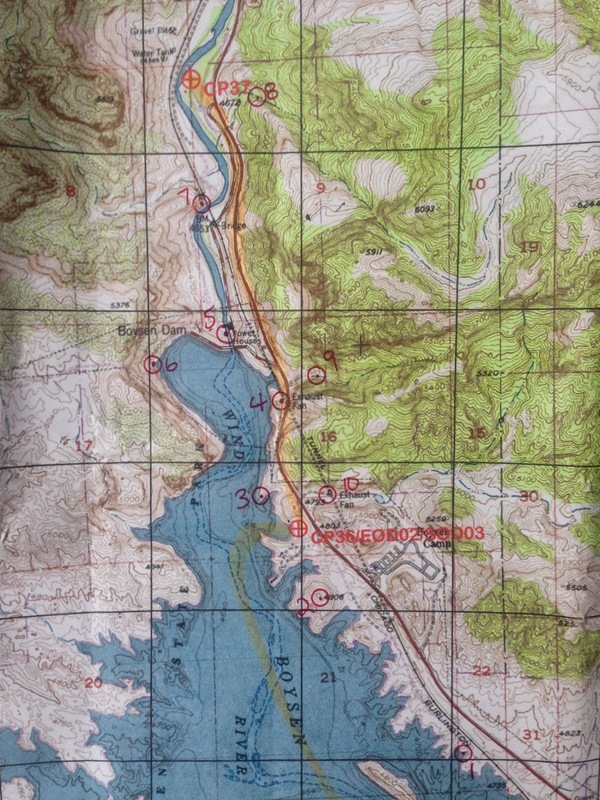 The water levels are a few meters higher than shown on the map, which is a bit tricky, especially considering CP35 is hung on a very specific point of land amid several other points of land. 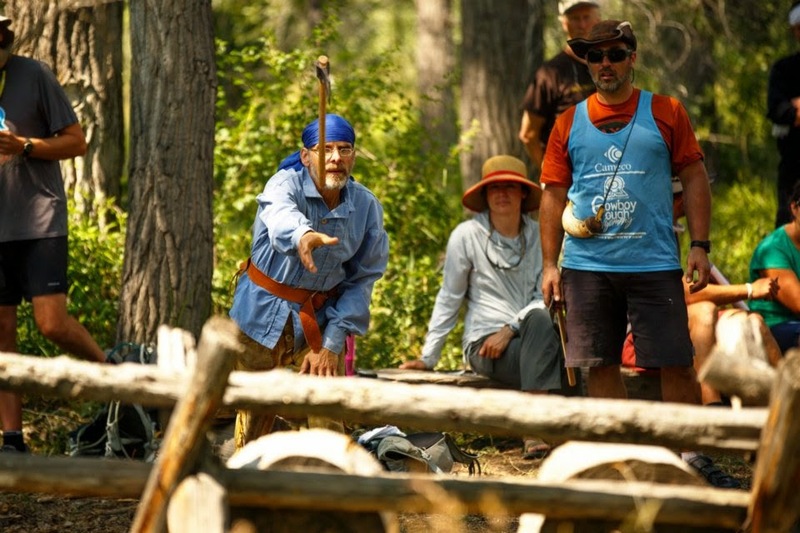 We paddle around CP34’s peninsula and past some real live bow-hunters on the way to CP35. As we paddle, multiple points of land emerge on our right side. Emily has a hard time matching them with the elevated water levels and we end up attacking CP35 too early. 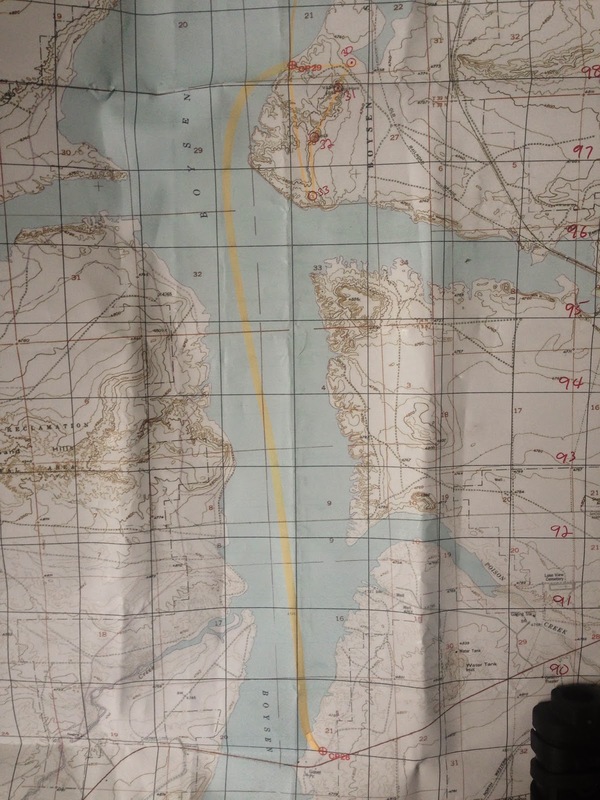 After a few minutes of paddling around looking for the flag, she cries uncle and flings the map back at Mike for him to make everything better. 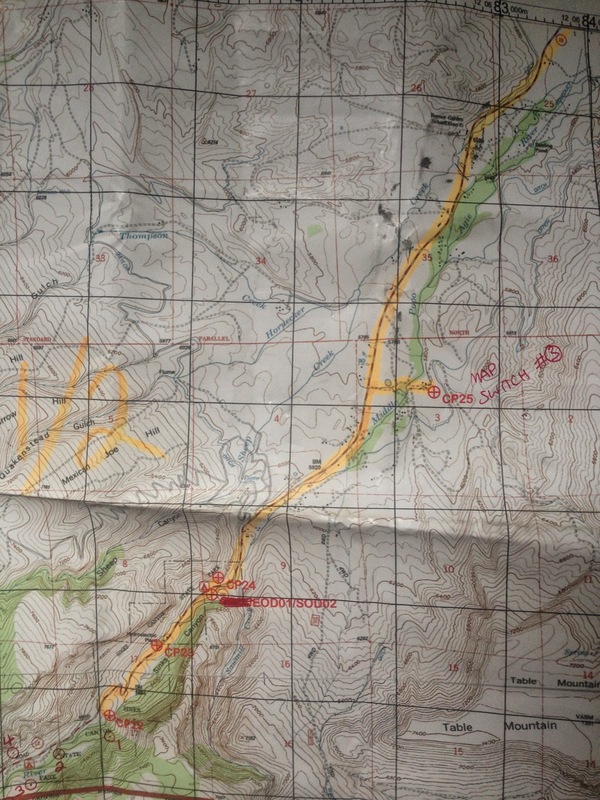 Mike takes a few glances at the map, a few looks at the terrain, and tells us to paddle out of the cove we’re in and continue on northward for a few more hundred meters before we get to CP35. Another 15-20 minutes lost, but at least it’s easily fixable and, since we’re paddling, doesn't add a single meter of climb! Adventure races always rely heavily on map-and-compass navigation, but within that skillset there is a range of technical proficiency. 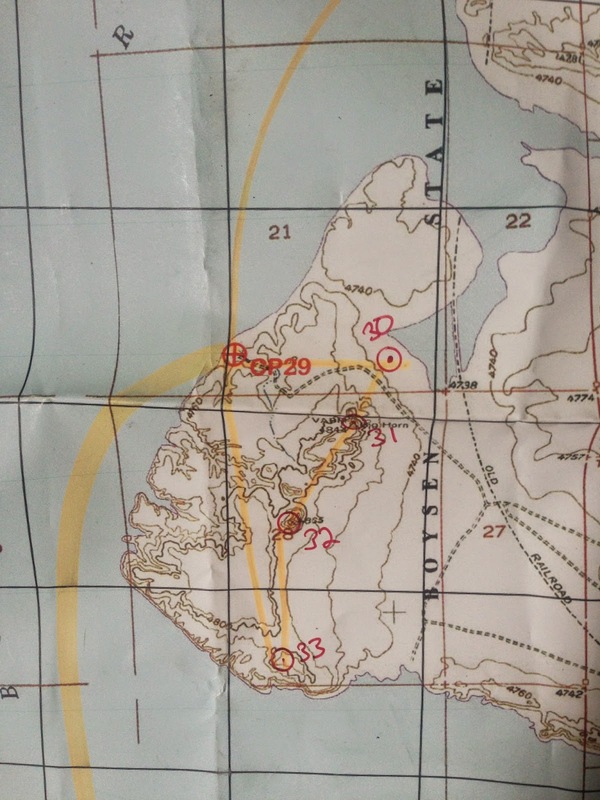 Navigationally, the easiest stuff is just like following a road map, and the hardest stuff uses no roads or trails at all, just identifying (sometimes very subtle) terrain features and moving between them, aka orienteering. 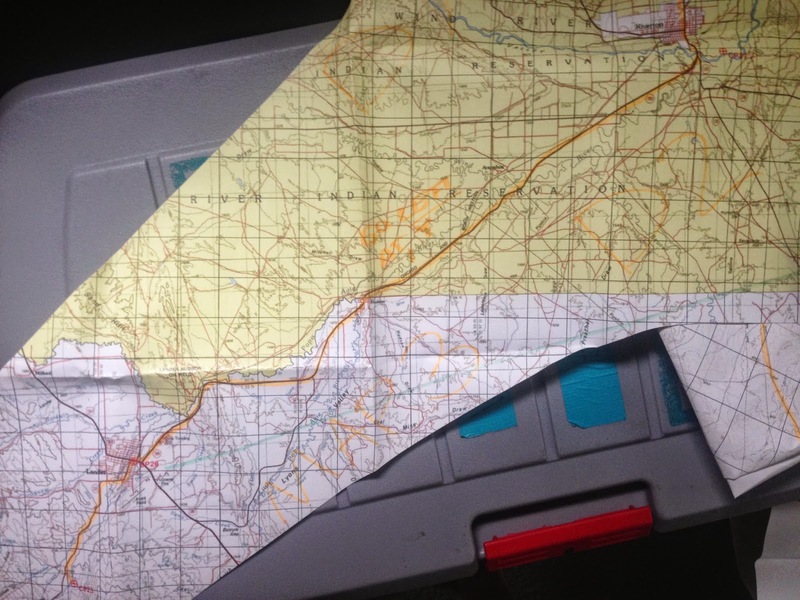 In the Midwest, our 24hr adventure races tend to use more orienteering than most expedition races, and as a result our navigators are very good. We've had races where teams from outside the region compete and struggle with the orienteering, complaining that it’s “micro-nav”. We smile and say, “Aw, that’s cute!” and then run off to the next control. Well, here, on the reservoir, the features are so big, so far away, and so visible, that it’s more like “macro-nav” and now we’re the team that’s struggling. Or rather, Emily just can’t pull her brain out of detail mode and into big-picture mode. After about five map checks in ten minutes, Mike asks for the map back and says “Just paddle already!”. Emily obliges, happy to have just enjoy the scenery instead of micro-anazylzing it. Without terrain to focus on, we turn our attention to the clock. We've got about 6 miles left of this paddle, and then a 7ish mile trek, and then that’s it. Done for Day 2. The sun is still annoyingly high in the sky, and we think that if we hustle we might be able to finish the trek before it gets dark, and then have a TON of time off the clock to eat and sleep. That is a tantalizing carrot to chase so we paddle with renewed vigor. We pull into a beautiful sheltered cove for the take-out and haul our boats uphill with plenty of daylight left for the trek. Our transition is relaxed and includes a few moments of chat with Tecnu and Columbia (who are already finished for the day), sharing intel that the nav shouldn't be too hard. Sweet! Let’s do this! Last trek of Day 2, CPs 1-10, all optional. Rachel in one of the reentrants. We run out of TA having picked up a friend - a Rev3 staffer with a fancy camera. He takes a bunch of photos of us as we punch CP10, making us feel like VIPs. Then we’re on our own for the rest of the optional CPs. Again, the nav isn't too challenging and we have a surprising amount of running on a major 2-lane highway, making travel very quick. We pick off a few CPs in roadside reentrants, then have to cross to its other side and figure out a way across the Big Horn River. We spotted a railroad trestle earlier and speculate that there must be a shortcut across it. It’s an adventure race, right? We run over to the bridge and sure enough, there are two 2x10s forming a walkway across the underside, with a single steel cable for a handhold. Totally doable….right? Emily on her way across. Mike goes first and doesn’t even use the cable. Then Andrei goes, slightly more tentatively but moving well. Then Emily goes, trying not to use the cable but it sure comes in handy in a few spots. Then Rachel goes, clearly uncomfortable but focused on getting to the other side. When we’ve all made it, we hear a 4x4 roll up to us and see that it’s Mark the race director. Oh no, did we just do something illegal? He sticks his head out and grins, “Quite the shortcut, eh? !” We laugh. Yes it is!! Andrei and Mike on the other side. Word is that Tecnu went across the TOP! We have a couple CPs on the far side of the river, then cross back over using the dam and have to run right back past TA to collect the final two CPs. They use a lot of road running as well and Mike is clearly hurting so Rachel takes his pack. We all are hurting, to be honest, but it is the kind of hurt that doesn't matter how fast you’re going, so we just keep jogging in order to be done more quickly. Second to last CP on the day. High point, natch. The sun is just starting to set as we reach the End of Day TA. We can’t really believe that we’re done so early! We unload our bins, chatting excitedly about everything we’re going to do at the most luxurious of all luxury racing TAs. First, we go swimming. Swimming! The lake is cool and so refreshing. Then we get to hang out and chat a bunch with other teams, including our half-naked friends on Team Tecnu. Then it’s time for actual sit-down dinner where Mike consumes about 4,000 calories and still feels hungry. Emily does some piddling with her bin, classic, and we all finally go to sleep around 10pm, under another beautiful night sky full of stars. It's really a shame the race was so un-scenic. Just looking at that railroad trestle made me feel a little sick.